The joys of a new puppy are endless. They’re playful, loving, and just plain adorable. That is until they struggle to hold their bladder. If you own one of these little ones, chances are you’ve had to clean up a few messes. But how do you thoroughly clean up an accident on the carpet? The first step in cleaning up a dog’s mess is to determine what you are dealing with. You could be scrubbing the carpet due to urinating and defecation. 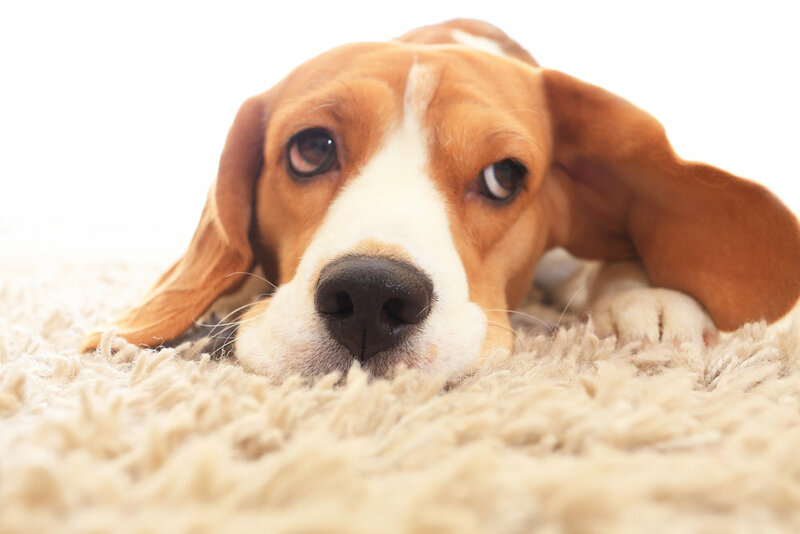 If your dog didn’t quite make it outside to urinate, use these steps to prevent carpet stains. Soak up any moisture with a towel. Mix half portions of water and white vinegar into a bowl, pouring the solution onto the urine stain so as to thoroughly soak the area. Take your scrub brush and work at the stain. Blot the area with a towel once more until it is dry. Take a handful of baking soda and toss it over the stain, finishing up with a half cup of hydrogen peroxide with one teaspoon of detergent used for dishwashing. Scrub once more and then wait until the carpet is dry. Vacuum the area for the finishing touch. When your dog chooses to squat inside, simply picking up the pile isn’t an option. The following steps, provided by Apartment Ratings will ensure that your carpet is fully cleaned. Using gloves, get rid of the dog poop with a paper towel. Be careful as to not push the excess into the carpet as this will be harder to clean. Spray the stained area with a stain remover, letting it soak for a few minutes. Fill a bucket with cold water and three teaspoons of laundry detergent. After stirring the soapy solution, dunk a sponge into it. This product should be non-abrasive and rung out of the extra solution. Use the sponge to blot the stain and start scrubbing. Once done scrubbing, dry it off with a towel and add a handful of baking soda. Vacuum the baking soda up and be stress-free when it comes to stains. If dealt with properly, your carpet can be free of stains with a puppy in the house. Hopefully, these steps will help you in the future so that you and your dog can spend more time playing rather than cleaning!